The rings of Saturn are an incredible sight to behold, but it is necessary to use telescopes to view Saturns rings. However, seeing Saturn and its moons is one of the most spectacular sights in the entire night sky. Unfortunately, some telescopes are of poor quality and won’t give you a good view of the ringed planet. The two primary factors that influence your view of Saturn are the aperture of the telescope and the magnification that you’re using. It is the sixth planet in the solar system. Saturn and it’s moons are located 746 million miles from Earth. Standing on Saturn would be impossible. The planet is a gas giant, which means that the majority of the planet is primarily composed of an atmosphere. There is a small solid core beneath a dense atmosphere and sea liquid hydrogen and helium. The reason why the core of Saturn is solid is that the lower levels of its atmosphere is composed of gets compressed so much that it becomes metallic. In addition, Saturn has several moons. One of the most notable ones is Titan. Titan is around the same size of Earth, and it is the brightest of Saturn’s moons when viewed through a telescope. There are many lakes, oceans, and rivers on its surface. However, these bodies of liquid aren’t water. Instead, they are liquid hydrocarbons. However, there is a possibility that microbial life of some kind could have evolved on Titan. They would use the liquid hydrocarbons as a medium to grow in. Saturn has 62 known moons in total, but most of them are very small. Another moon that may be visible during amatuer astronomy is Rhea. Rhea isn’t as large as Titan. Unlike Titan, the atmosphere is quite thin. However, it has its own small ring system. Two other well known moons orbit Saturn as well, Dione and Tethys. These two moons also can be visible to those who practice amateur astronomy. The rings of Saturn are composed of meteoroids that have been captured by Saturn’s gravity. They are broken up into several sections, and there is a gap between two large sections of the rings. This gap is called the Cassini division, and its around 3000 miles wide. It’s visible in telescopes if you use a high enough magnification. When Is The Best Time To Look At Saturn And Its Moons? The best viewing time for Saturn varies depending on the position that Saturn is in its orbit and the time of the year. In 2017, Saturn will be visible in the morning until June. During June, Saturn will not be visible at any time as it will appear in the sky too close to the sun. Then, it will be visible in the evening from July through December. In January of 2018, Saturn will become visible again at dawn, and it will remain visible in the morning from February through May. If you are interested in seeing the visibility of Saturn anytime from 2017 to 2022, you can see it here. So what telescopes are best to view Saturn? Below is a selection of three telescopes suitable for viewing Satrun and its Moons. By no means an extensive list but a great start for the amatuer astronomer. The Celestron 21041 60mm PowerSeeker Telescope has an aperture of 60mm. While this isn’t a lot, it’s a great telescope for its price. The mount is quite stable, and this will allow you to get a stable view of the planet. In addition, the telescope comes with eyepieces that allow for a fairly high magnification. It’s 700mm long, and the smallest one is 4mm. This allows for a magnification of 175 power. This enough to clearly see the rings of Saturn on a clear night. With clear enough conditions, you’ll be able to see the Cassini Division in the rings. The telescope’s aperture is enough to see Titan and Rhea. You also would be able to see Dione and Tethys under some circumstances. The Orion 10012 SkyScanner 100mm TableTop Reflector Telescope (Burgundy) has an aperture of 100mm and is easy to transport. The mount for the telescope is much more compact than the mount of The Celestron 21041 60mm PowerSeeker Telescope. 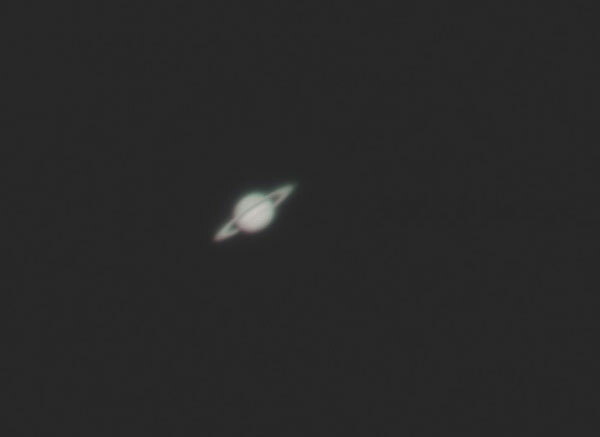 The 100mm lens is large enough that you’ll be able to see plenty of detail on Saturn even if you are in a light polluted area. You’ll be comfortably able to see Titan and Rhea, but you’ll also have a much better chance of seeing Dione and Tethys. It has gotten great reviews with a four out of five star rating on Amazon. The Orion 8974 SkyQuest XT8 PLUS Dobsonian Reflector is one of the best telescopes that you can get for a reasonable price. It’s double the aperture of the Orion 10012 SkyScanner TableTop Reflector Telescope, and it features an aperture of 203mm. This is enough to get truly stunning views of the rings of Saturn, along with clear views of Titan and Rhea. In addition, you’ll be able to see Dione and Tethys under most circumstances. The telescope also comes with a tray to hold eyepieces. This makes it exceptionally convenient to change the magnification of the telescope. It also has excellent reviews on Amazon, and you can buy it here.